I find symbols magical. Visual nutshells, sometimes encompassing the ideas of entire organisations, and even countries – the compression of large ideas into a startlingly small physical form – often gob-smacks me. Sure, we do this everyday for a living and the love of it. But every other day, it continues to put me in ceaseless wonder, when references pop up and symbols are used as part of the vocabulary of persuasion, propaganda and conversation. 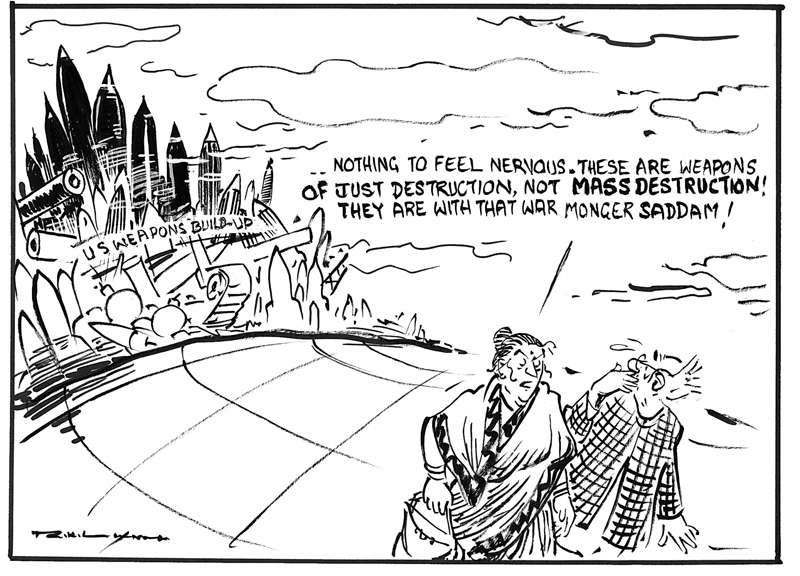 Last week, R.K. Laxman, the creator of one of India’s most endearing and enduring symbols, passed away. 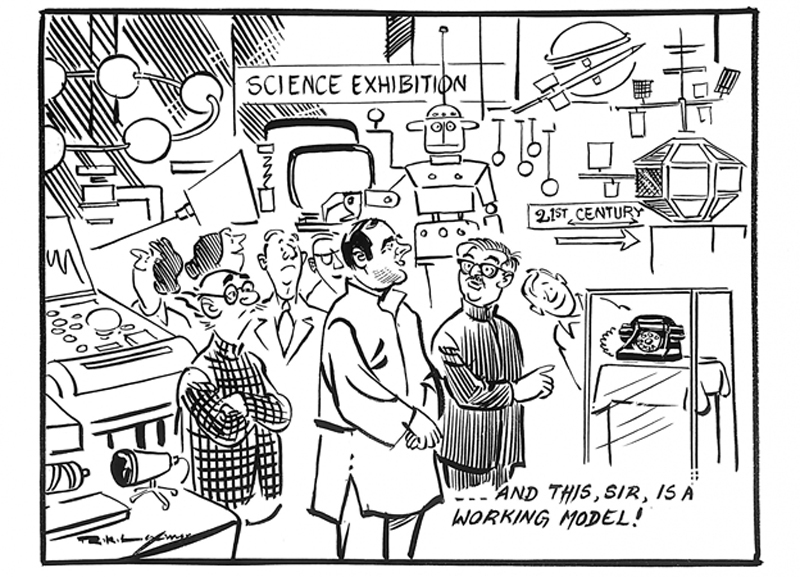 R.K. Laxman’s Common Man, as he is popularly called, first appeared in 1951. 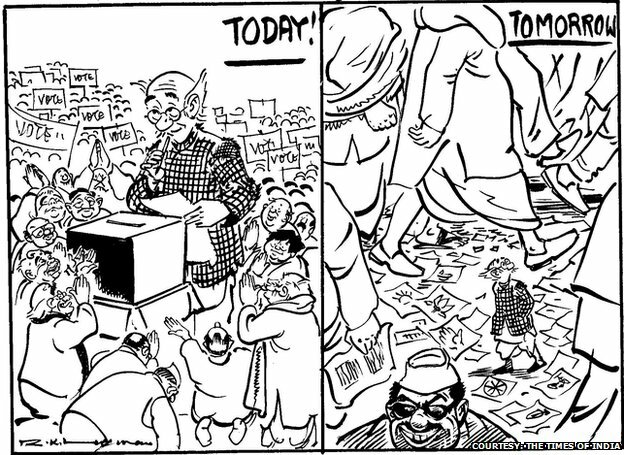 Interestingly, when cartoonist R.K. Laxman first started illustrating for the national daily, Times of India, he attempted to capture the diversities of India through multiple characters. 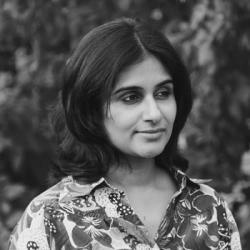 Over time, the motley crew disappeared, leaving behind one man, as representative of the everyday, everyman in India and the bearing of national-level events and policies on his/her life. The past few years have seen a persistent debate and a great surge of interest on the question of Indian identity in design. The Common Man is a great example for me, of the finely nuanced manner in which identity can be expressed. The Common Man has a marked physical appearance and singular garb, yet he became the voice across gender, age and geography for a burgeoning middle class. It is not so much how he looked, but more so how he viewed and reacted to bungling administration, rising prices and what-not. He was neither neutral, nor opinionated; but he was empathetic, observant and vulnerable. His limited canvas, in a single frame sometimes, captured a moment – and in that one moment, not more not less, the reader sympathised, observed and flinched, the same as the Common Man. In intentionally pithy delivery, we become the Common Man. And we remember him then, in similar bite-sized bursts, peppering conversations and reflections. As the Common Man moves to inky pastures with the passing of his creator, it leaves me with 3 things to think about. One, that symbols need not always be abstracted summaries. Often, designers begin work on symbols beginning with a self-inflicted constraint of minimising, simplifying and summarising. However to assume this is an intrinsic quality of symbols may be erroneous. Symbols can be – according to their context – a medium, a response and other elements of a conversation as well. Symbols need not always be simplified, an extended function may sometimes need complexity and layering to complement. The second idea that the Common Man leaves me with, is that the construction of narratives within which symbols are placed, have the power to imbue them with meaning and remembrance. The symbol itself, is one of the actors in a narrative and builds collective meaning in combination with other elements of storytelling such as pace, sequence etc. If you’ve been to any design talk or conference in the past 2 years, there’s a good chance you have heard multiple references to ‘storytelling’ in design. Most designers refer to ‘storytelling’ in the context of a larger approach to branding or communication design. If there was ever a good time to look at a symbol as an actor in a larger story, this is definitely it. Lastly, what is most relevant to the continuing debate on Indian identity, is the Common Man’s ability to stand as a national symbol. Most people argue that it is impossible to address communication design in India through a singular lens because of its mind-boggling diversity. However, looking at identity, beyond traditionally ascribed silos of regional culture etc, can reveal common threads that run through the country and in the way people live, love and dream across it. Creating new pan-Indian symbols demands a new way to identify audiences and emerging sub-cultures. As the rest of India reminisces and bids farewell to R.K. Laxman and the Common Man, it seems a bit strange to end this post with ‘Rest in Peace’; probably because the Common Man made it his life’s mission to stir things up. So, here it is: Goodbye, and do not rest in peace. Images above, courtesy The Times of India.